A seven metre high sculpture Human Endeavour commemorates the achievements of the workers in creating the Big Hill Cutting. The original plaque on the monument was stolen and a second plaque placed on the sculpture at a later date was also stolen. The Picton-Mittagong line was originally built in 1867 to extend the Main Southern Line. The line originally ran westwards from Picton Station, over the Picton Viaduct, across the Great South Road, thence through a 592-foot (180 m) tunnel in the Redbank Range and turned southwest. Stations were constructed at Thirlmere (1885), Couridjah (1867), Buxton (1893), Balmoral (1878), Hill Top (1878), Colo Vale (1883) and Braemar, 1867. There were a number of smaller stops ('halts'), sidings and passing loops along the line, as well. North of Hill Top, the cutting through Big Hill was for many years the deepest in Australia. During construction in 1863 an explosion killed three workers whose names are carved in perpetuity in the rockface. 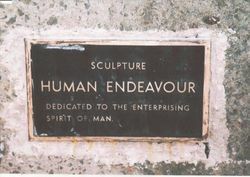 Human Endeavour Sculpture in Place. A seven metre high, 37 tonne concrete sculpture "Human Endeavour " was erected at Hilltop, near Saddleback Bridge on Monday, as a gift to all and a tribute to the men who toiled over a century ago to cut Australia's deepest railway cutting nearby. Balmoral sculptor Mr Joe Enfield cast the huge work of art in two sections, a smaller mass forming the base and representative of an Atlas and the larger, 21 tonne top section balanced upon it forming a series of interesting triangles. Mr Enfield cast the two sections on site and on Monday, two big mobile cranes inched the massive top section into place, joining precisely on four long retaining bolts which lock the massive work of art together. 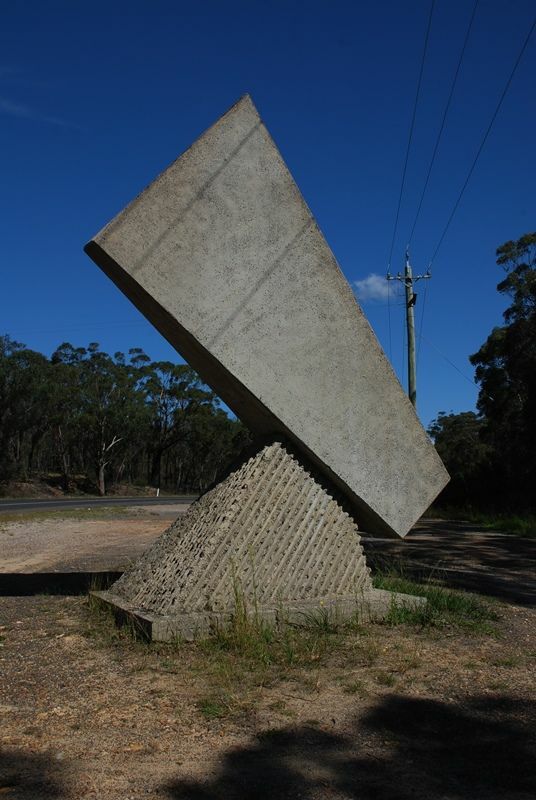 Mittagong Council, who had approved the project some time ago, was represented by the Shire President Cr Jim Gasson and Hilltop Councillors Mrs May and Bert Chalker, all of whom voiced approval of the massive grey sculpture. "It is certainly a work of art and a very generous gesture by Mr Enfield", said Cr Gasson. About twenty local residents were present during the erection process and all were delighted with the final effect, certain to become a landmark, especially if promised landscaping later results in the area being used by the passing public. Southern Highland News (Bowral, NSW), 19 March 1980. Carving the deepest railway cutting ever through a sandstone mountain outcrop at Hilltop over a century ago was a monumental task for men with only hand tools and blasting powder and now as a monument to them Balmoral sculptor Joe Enfield has erected a masssive concrete sculpture near the scene of their labours. The sculpture, in sandblasted ore-cast concrete makes an impressive sight in the silent bushland setting neaar Saddleback Bridge at Hilltop where it was erected last Monday. The mechanics of the sculpture are impressive, it weighs 37 tonne and comprises two main parts, a base of smaller mass which supports a heavier 21 tonne section. This structure is reminiscent of Atlas, supporting the world on his shoulders and its composition in a number of traingular forms involves the strongest geometrical figure known. The sculpture lies in the east west line and throughout the day, the passing sun throws and ever changing shadow pattern which further emphasises the triangular shapes which are the predominant feature. It is particularly awe inspiring on a moonlit night in the absolute silence of that unspoilt area. Mr Enfield, a German born and a hard working plumbing contractor in Sydney for 25 years, came to Balmoral with his musician wife Ann four years ago where at last he could indulge himself in art. He had developed an interest in sculpture in Germany as a young person when he had helped a sculptor friend of his father and his interest carried through to a major work in Sydney about six years ago. This is the three metre high metal sculpture entitled The Twelve Tribes in Neutral Bay on which he and several other craftsmen worked. And Joe will be remembered with affection by many of the young who received such a unique grounding in appreciating art and craft at the Childrens Workshop in Bowral. There he gave lessons in metal sculpture to many budding artists. Now it may be said he has created his own monument (although he certainly would not see it that way) a concrete grows stronger with the passing years a truth "stands against time". Additional information supplied by Max Rogers, Berrima Historical (Archives). Photo of plaque supplied by Leonie Knapman, Berrima Historical Society Member.